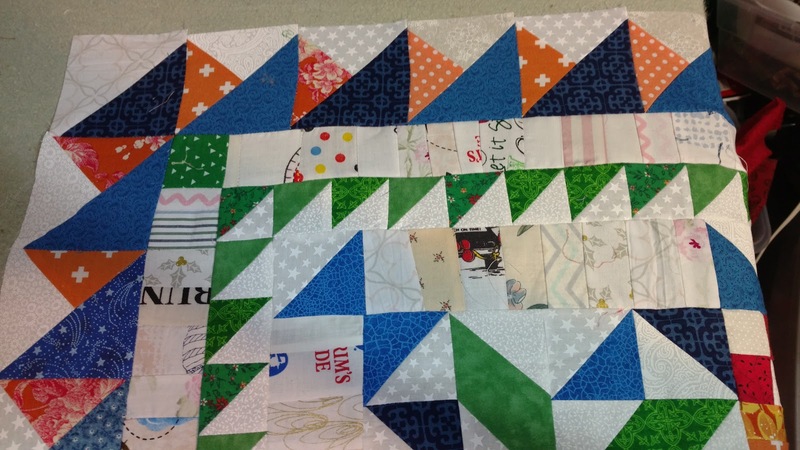 I have put my blocks together for the Sand Castles quilt from Bonnie Hunter's String Frenzy. This isn't the greatest picture, but I don't like to handle tops too much before they are quilted to avoid stretching the edges (even though I stay-stitched them). So, I simply draped her over the countertop (she's a BIG girl) to give an idea of how she looks. After quilting, I'll hang her outside and get a better photo. I'm continuing to work on Bonnie Hunter's Sand Castles quilt from her latest book String Frenzy. I finished all the parts, so I'm now assembling blocks. I love the way these are fitting together. The sashing provides a perfect fit for the seams pressed towards it. Everything ends up very flat and neat--front and back. This is the back of the sample block. For a little extra fun, I included this block. 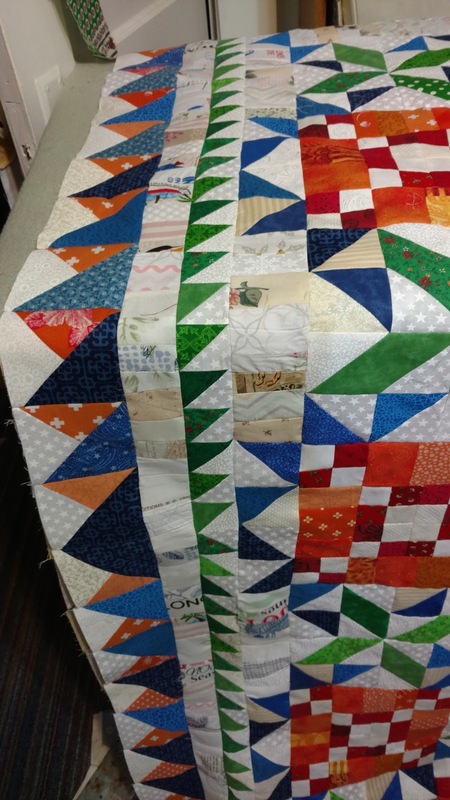 It may be a challenge to find amid the many four-patches when the quilt is done. I have finished the top of my good fortune mystery quilt. I liked adding a border that was string pieced. It meant there were no seams to match. March is coming to an end and I have finished all my projects for my one monthly goal. 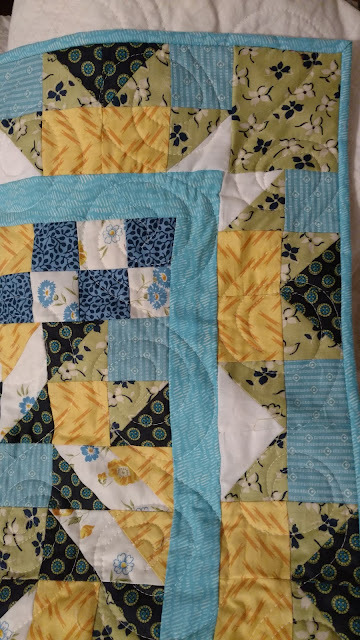 I added borders, quilted and bound the Denise Schmidt version of Grand Illusion, a quiltville mystery quilt that I am calling sunshine skies. Though I live nowhere near the beach, I'm starting assembly on the Sand Castles quilt from Bonnie Hunter's book, String Frenzy. I think I've got the process figured out now, so full steam ahead! I'm enjoying String...errr...Spring Break this week. I cleared the decks of projects, so I could start an new one during this week of time off from teaching. My new project, you ask? This quilt is from Bonnie Hunter's latest book, String Frenzy. It includes string blocks and lots and lots (and lots and lots!) of four-patches. As you can see, I've been working on the string blocks. 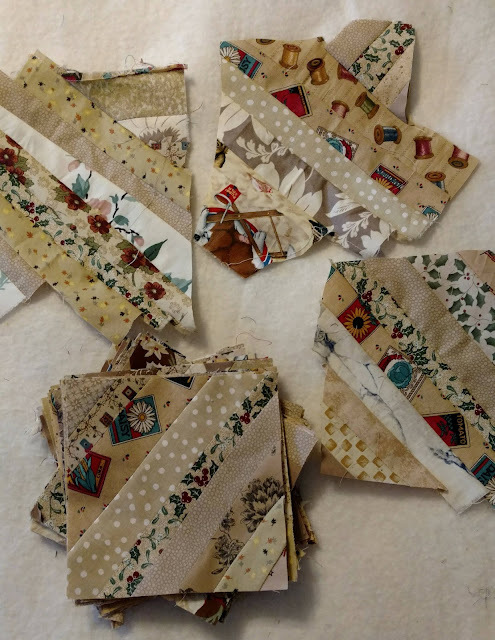 Today, I'm sewing strips together for the four-patches. Patchwork times has an ufo challenge for 2019. I have enjoyed using some sort of ufo motivation for my quilting these last couple of years. She suggested 12 of them. I am sure my One monthly goals will also use help finish these projects along.